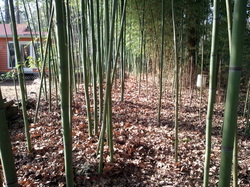 Brightside Bamboo is a specialty bamboo nursery and landscaping company in Chapel Hill, NC. In business since 2010, we are the bamboo experts. We specialize in using bamboo for privacy as well as the containment, management, and removal of bamboo. Our nursery hours are Mon - Fri 8 am - 2 pm and Sat 10 am - 4 pm. You can also set an appointment if you need to come outside our normal hours. We do offer consultations if you have bamboo that needs to be removed, contained, or managed, or want to plant bamboo for privacy, farming, or other reasons. The consultations last about 1 hour and include a plan of action with multiple options, quotes for us to do the work, and a credit of the consultation fee toward any future work done by Brightside Bamboo. The cost for the consultation in Chapel Hill, Carrboro, and Durham is $120. Other areas within the Triangle from Alamance County to Wake County to Chatham County is $140. If you're in the Triad the cost is $160. We do cover all of Virginia, North Carolina, South Carolina and Georgia down through Atlanta for a custom fee. 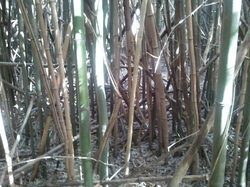 We also offer bamboo poles year-round and fresh edible bamboo shoots in the spring. Read the complete description of our services. brightsidebamboo final v2 from YardSprout on Vimeo. Join our mailing list to be notified of upcoming workshops, seminars, bamboo tips, and news.